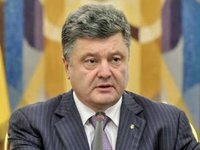 President of Ukraine Petro Poroshenko sees his task in creating political conditions for ensuring maximum productivity in carrying out reforms before the start of the electoral cycle. "We, I mean the authorities, should speed up the changes, realizing at the same time the approach to the electoral cycle of 2019. It will be more difficult to collect votes for reforms. There is only a year or less before this. And I see my main task in creating political conditions that will enable us to get the maximum speed and, persistently, in the 'team building' mode, will cement the coalition," he said during a general meeting with business in Kyiv on Friday. According to him, all this will ensure the most effective work in the "president-government-parliament" triangle. Poroshenko also noted that he expects to support business.